"Wakefield was a bustling center of transportation in the late 1800's and early 1900's because of the Wakefield & Stoneham Street Railway Company. What began as a two-mile route from the Wakefield Post Office (on Albion Street) to the junction of Main and Elm Streets in Stoneham, eventually became a four-direction electric street railway system which residents could ride to Lowell, Lawrence and Haverhill to the north Malden, Chelsea and Boston to the south Lynn, Salem, Beverly and Gloucester to the east and Woburn, Winchester and Medford to the west. Planning for Wakefield's street railway system was started by Col. Charles F. Woodward. The street railway company was formed in 1889, before anyone realized the need for such a system. He was instrumental in securing a charter for the company in May, 1892, and before long, 'strong capitalists' became interested in the project. In the summer of 1892, tracks were laid along Albion Street to Elm Street, Stoneham and the first car was run over this line on August 14, 1892. 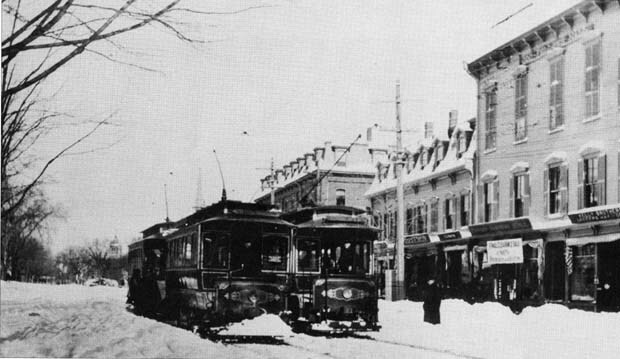 Tracks were laid from the center of Wakefield, down Main Street to the Melrose line, and in the fall of 1893, tracks were laid from Wakefield Town Hall (at the corner of Main and Water Streets) through Saugus to the Lynn line. This route was opened in April, 1894. After much opposition, the Wakefield & Stoneham Street Railway Company extnded its line from Wakefield center, via Main and Lowell Streets, to Reading Center, in May, 1894. All these routes were extended within these communities. The railway met with such success that double tracks were added in the early 1900's. By 1918, however, the automobile was responsible for the demise of the street railway. The Reading route was discontinued in 1918, with the Lynn line following in 1920, and Stoneham by 1929. All street railway routes were out of operation by May, 1931. " -- Text from calendar by Jayne M. D'Onofrio. “Wakefield & Stoneham Street Railway, circa 1907,” NOBLE Digital Heritage, accessed April 22, 2019, https://digitalheritage.noblenet.org/noble/items/show/7115.